The Diva Challenge #103 was to raise awareness for Moebius Syndrome. I felt like I needed to stretch out when doing the Moebius Foundation graphic, so I used a Zendala tile. Drawing the logo was a little daunting, but I actually found it a bit easier to do once I just broke it down into shapes, and stopped thinking of it as a never-ending ribbon that I might need to understand. Even if it's a little cattywampus, I like it that way. I filled the background with NZeppel, and the edges became PokeLeaf. 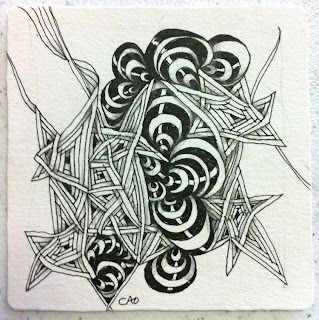 Not sure why I chose those two tangles, but after it was there it seemed to say something about growth and connectivity. Symbols are everywhere, even though we often don't know their meaning. I added purple, which I hardly ever do, but that's the color for MSAD. Read more about it via Laura's blog. I loved doing this tile. 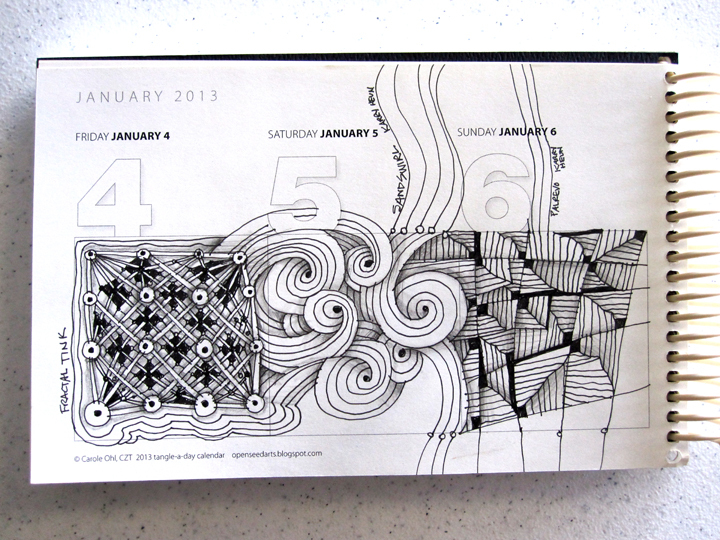 It seemed to go on and on, and after that I did 3 days worth of Tangle calendar entries, and then another whole tile. I had pretty 'pencilly' hands after all that shading. Fun. Thanks, Laura, for another jumpstart for me to get tangling. Whether you tangle often, or just occasionally, you probably have hit a little wall wondering which tangle to use next. 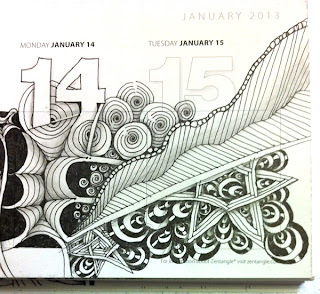 Now that I'm back into a semi-daily groove with tangling in my calendar, this happens to me quite a bit. Thank goodness for the community of tanglers who have come up with a variety of patterns to play with. One of my favorite go-to resources is tanglepatterns.com. Linda Farmer (CZT) has done an outstanding job at organizing and linking step outs to new tangles as they come on the scene. My favorite tool from her is the Tanglepatterns.com Tangle Guide. This is a pdf that sits on my computer desktop, staying handy for fresh ideas and challenges. Click here to find out how to get one of these jumpstart jewels! The cover alone is an inspiration, with Zentangle art by the awesome Shelly Beauch. 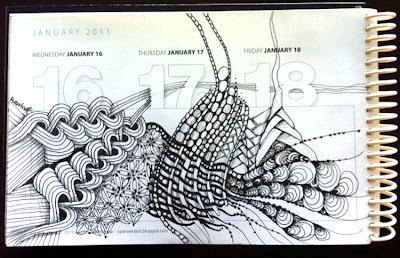 This portion of my calendar began with a new tangle this week called Heartrope by Bunny Wright. As the days rolled on, I was in a Quandry so I clicked on my handy Tangle Guide 2013 and mixed a little of a lot: Basketweave, Beadlines, Onomoto, Bunzo, Betweed - all found right at my fingertips! This page in the calendar may be a little bit busy, but that's my life right now. Taking the time to tangle this morning really helped me center. Now I think it's time to clean off my desk while I enjoy my new Starbucks concoction: Skim Misto (grande) with two shots of mocha and two shots of vanilla spice. Methinks cleaning off my desk will be fun. The last eight months for me have been a whirlwind of ramped up activity, mountains of details, and lifestyle adjustments. It's all been a ton of fun, and lots of hard work, but there is a flow that I feel that helps me know I'm exactly where I belong for the moment. One of my prominent lessons is letting go of the lists, and allowing time for what is being called for at the moment. That might mean lunch with a friend, even though I may have a pile of other things to do. It might mean I forego lunch with a friend because of the piles of things to do. Each moment asks me to participate in its own way, regardless of the rules I hold about it. There are many "shoulds" to follow, but we get a chance to move beyond those and do what is intuitively "right" for that moment. In the past couple of weeks I've made a real effort to allow for my intuition to take a real front and center. As it turns out, I had one day that began with a breakfast with a friend at 8:30 and by 11:10 I realized I might be late for my lunch date with my mom. Now that's a great morning! I set my lists aside, and what transpired was a really meaningful morning with deep conversation and swirling insights. The flow is a wonderful thing. 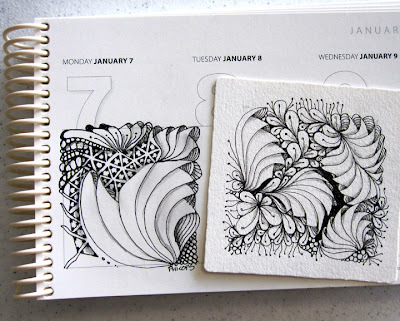 Sitting down with Zentangle always reminds me of that. The more I do, the more I see the experience of flow with Zentangle helps me float my way to each appropriate moment in the rest of my day. Thanks universe. I am one lucky girl. Below is a combination of what I did on my calendar in Peg's class plus this week's Diva Challenge. I then did a tile just with the Diva Challenge. Flowin' Fun. The Diva Challenge has returned after a short and well deserved holiday break. The challenge is a bright spot in my Monday, even if I don't get to tangle the challenge. But a new year has begun, and as many of us settle into a new "improved" routine, one of mine is to allow more tangle time. I don't really like the thought of one whole year being new, as it can be very overwhelming to think I have to keep up with any of the changes I've set up for myself. For the past 5 or 6 years my creative friends and I gather on New Year's Day to start the year with a creative community. This year we held our party at our new bead store. We invited the general public to gather and do whatever it is they love to do. There was a little beading, scrapbooking, quilting, tangling. Great fun. One of our partiers greeted each person with "Happy New Day" rather than the customary "new year". We liked that and decided it really took the pressure off of trying to have a whole new happy year. One day at a time, we can handle. Even if I have a bumpy start to a day, it can often work itself out. 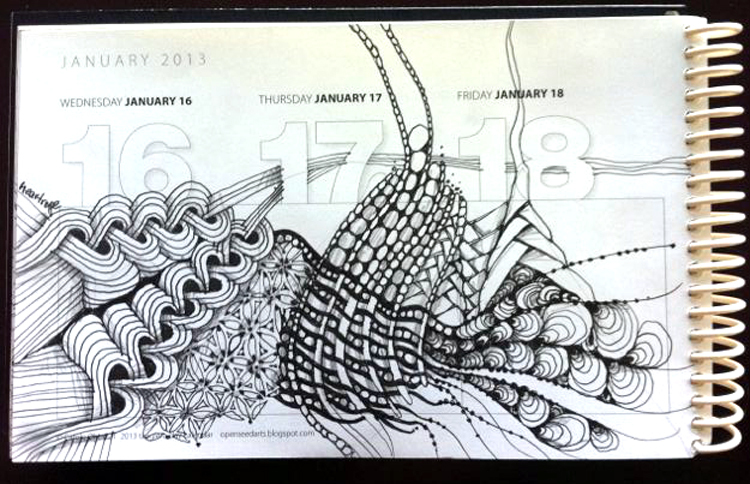 This week's Diva Challenge was a new tangle created by Laura's husband, Brad. (Happy birthday today, Brad!) I had a bumpy start with this one. 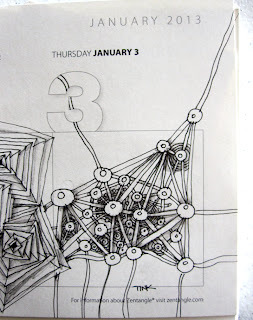 I started it directly in my Tangle-a-Day calendar, which is always a leap everyday. Each day I make a dedicated attempt to take apart my tendencies to "make it pretty." Calendars and journals can be tricky that way. I had already started January 7 with a little bit of Tripoli, left over from a conversation with Peg Farmer. I began the Phicops challenge tangle in the larger space, and added a couple more in the leftover spaces. It took me a few tries to get the rhythm and direction going, so I pulled out a prestrung Zentangle tile and tried again once I 'got' it. The rhythm of Phicops called to mind the Flux tangle, so the dance went in that step. I finished it off with a little Fescu. Thanks Laura and Brad! Have a great week, everyone. 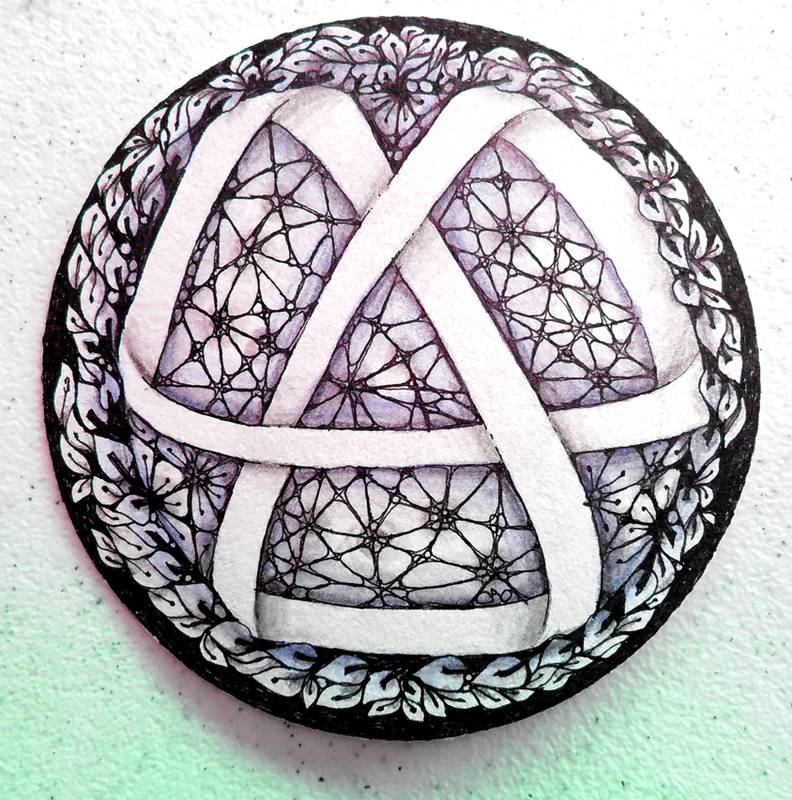 The art of Zentangle® is a far reaching organism. Its tentacles are long and lanky, and they tend to curl around and get into places that naturally ask for its wild, yet orderly nature. I'm trying my hand at a new technique called soutache embroidery. I have much to learn! 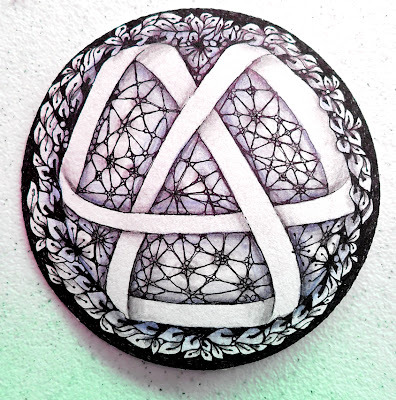 It involves beads, yes, but it has such a Zentangle quality in that you can do it without planning. Many people do plan with this technique, and one of these days I might have to. 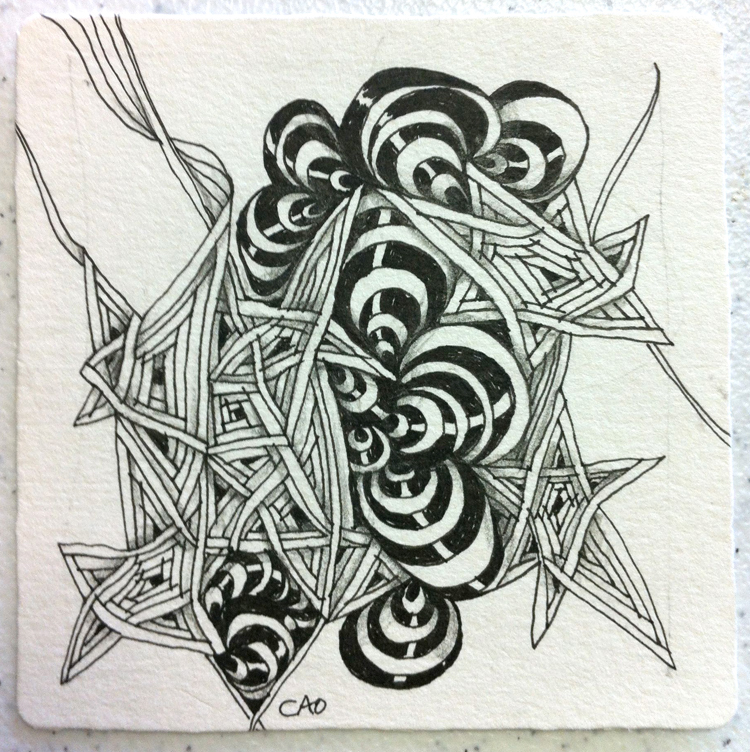 But right now while I'm playing, I am grateful for the open door that Zentangle brings to this new endeavor. The 'what-ifs' collide with the 'can-it-be-dones' and often there is frustration. But one thing Zentangle reminds me is that there is only moving forward. In this case, one can take out the thread, but that is even more bothersome, so one finds ways to keep going with the learning/creative process. I did find a tutorial that helped me on the technical side of this technique. I have to give a shout out to Amy Sweet-McNamara for a great tutorial! 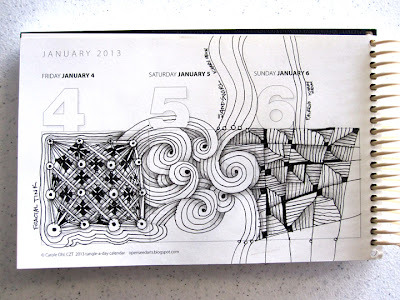 I've also been keeping up with my Tangle-a-Day Calendar. I've fallen in love with Peppermint Mocha coffee, so on my cold car trip to the shop each day, I stop and get a nice hot treat, sit down with my calendar and begin the day in peace and quiet. There is so much online these days with so many tangles everywhere you look, that it will be easy to find at least 365 of them to fill my daily pages. I'm looking forward to what the year will bring to this little bound pile of papers. Looking forward to seeing what others do with theirs. 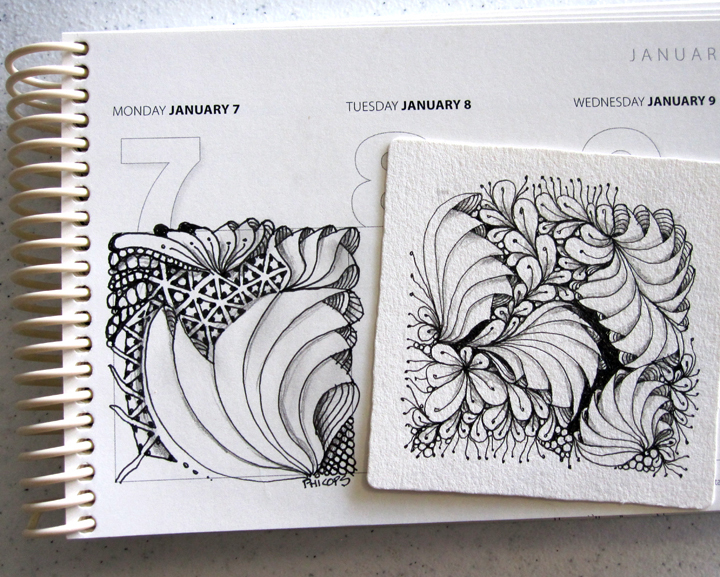 I've been lucky enough to live near Peg Famer (CZT) and love to see what she does with her calendar pages. I look at them, think I've seen everything, and then I look again and find something else to squeal over. Thanks, Peg!